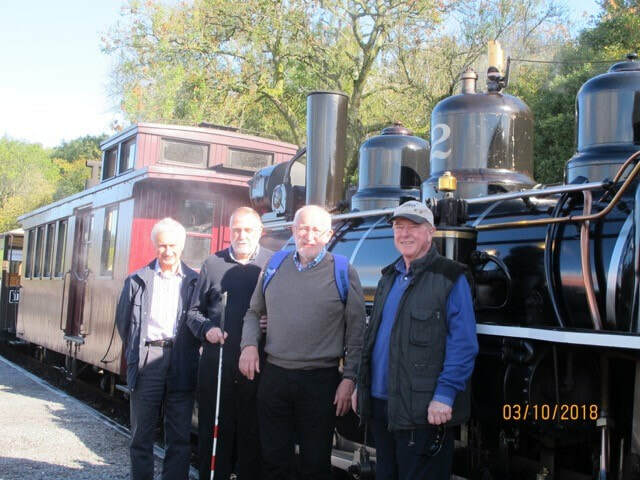 Fron the 2nd to 5th of October nearly 50 members of our U3A travelled to Cardiff for our annual autumn short break. 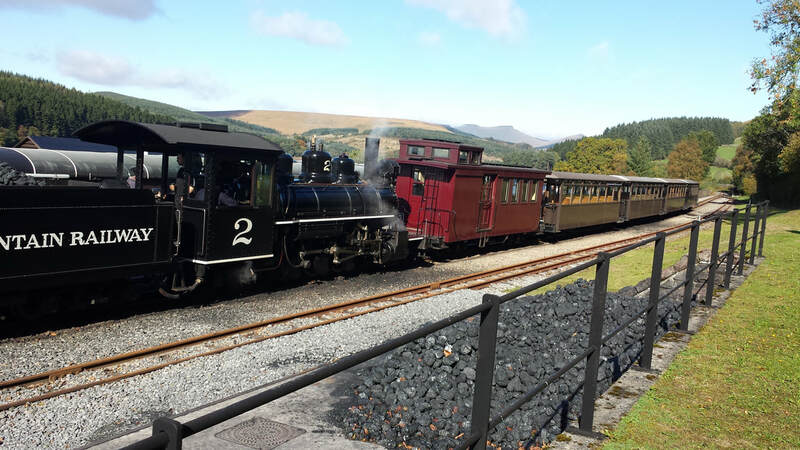 The highlight of this visit (from our point of view) was a visit to the Brecon Mountain Railway. This narrow gauge railway (1ft 11 1/2 in gauge) is actually built on the trackbed of the old standard gauge railway from Merthyr Tydfil to Brecon. The heritage railway is 5 miles in length and it passes through some outstanding scenery on a steep gradient as makes it's way up to Totpanyau where a tunnel (now closed off) pierces the highest part of the Brecon Beacons. The weather was perfect and we had time to take pictures and visit the small museum where there are immaculate restorations of a Quarry Hunslet and two vertical boilered locos which were used in Welsh slate quarries. 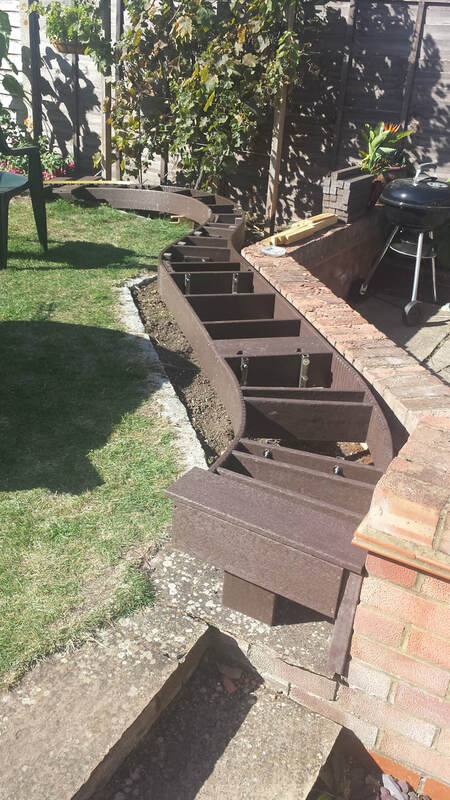 A combination of getting older (wonky knees) and the difficulty of setting up steam locos at ground level made Pete consider creating a raised steam-up area near the patio. It would mean a steep gradient down to ground level but this was considered acceptable as trains will not attempt to return up the gradient. The structure is made of Filcris. This material is strong, flexible and almost indestructible but it cannot be glued, though it does securely accept screws. The structure is yet to be finished so more pictures will be added later. 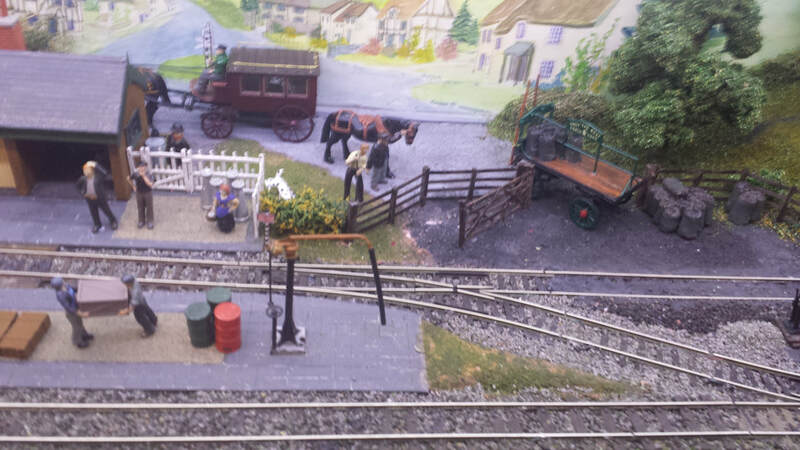 The idea for a small indoor model railway came in early 2016. 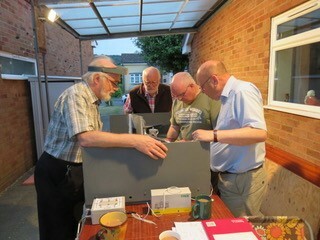 Some surplus rolling stock to a scale of 7 mm to one foot became available from friends in my other club, the Merioneth Railway Society and the 10th anniversary of Aston Clinton U3A was on the horizon. As group leader of the A.C. Model Railway group it seemed encumbent upon me to spearhead a display at the exhibition to be held in September that year. I had not built a layout to this small scale since the early 1970's so I was totally out of date with the present modelling scene. With the help of Pete S., Terry B., Phil W. and Chris H. I was well assisted! I am also grateful for the artistic skills of Pat A. of the A.C. Art group who did an amazing job of painting the back scenes. A theme and layout plan were devised and construction commenced in June 2016. One side now depicts an “idyllic English village station” and the other contrasting side a slate enamelling works, the “satanic mills of North Wales” - the Dark Side! 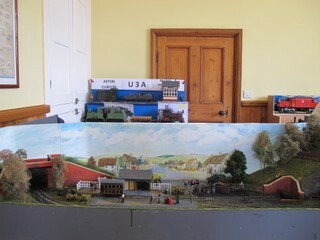 The layout measures 4'-7” by 2'-4”, an easy size to carry and transport in the back of my estate car. The village station side was completed for the U3A exhibition but it was another year or so before the Dark Side was suitable for exhibition. Everything was kept simple due to the steep learning curve. The track plan is simply an oval circuit with mirror-image sidings and headshunt on each side. 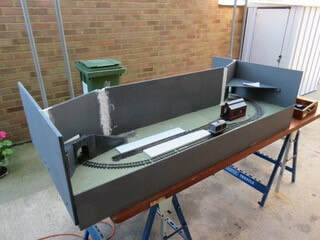 The baseboard was constructed of 6 mm plywood forming a rigid box with upstands for the scenery division between the two halves. 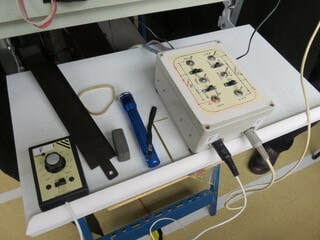 Locomotive control is simple 12 V DC using hand-held rotary controllers. Points are electrically operated, and switches operate various track feeds and isolating sections. 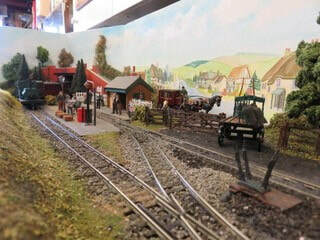 The layout can be easily operated by two people with the possibility of separate locomotive operations happening on each side of the layout at the same time. 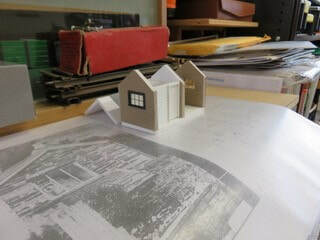 The buildings are constructed of foamboard, card and paper with printed sheet overlays for the external finishes. Scenery is constructed of polystyrene [from packaging], contoured to shape and covered with plaster of paris and painted with various green tufty materials overlayed. The figures and vehicles come from various suppliers of white metal and plastic kits. All items are hand painted. For ease of construction I have used standard, easily available “OO” track at 16.5 mm gauge to represent 2'-3”. 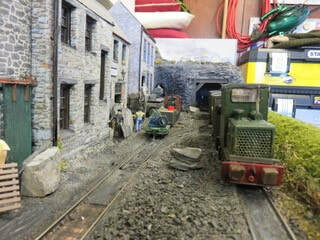 This is the actual gauge of the Corris Railway track in North Wales, the railway used for inspiration for this model. Actually 16.5 mm at 7 mm scale is just over 2'-4”, but that's close enough really!. Locomotives are kit built bodies to 7 mm scale fitted onto manufactured “OO” gauge electric motor chassis. Carriages and wagons are again 7 mm scale kits made to fit on “OO” standard chassis. There was a bit of a lull before construction started on the “satanic mills”, but these were ready for our next exhibition outing at Eaton Bray in November 2017. 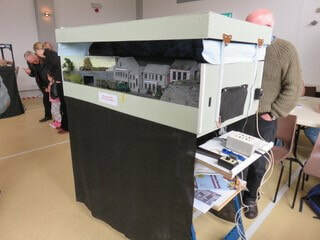 “Wilstone” was invited to the Tring Model Railway exhibition in Pitstone in April 2018 and made another appearance in Aston Clinton in June 2018 at the 40th anniversary of the Tring MR club. “Wilstone” has been invited back to Eaton Bray in October 2018 so further upgrade works are already in hand. The double-sided aspect on “Wilstone” has proved to be very welcome to the public; they like the different models on each side. The children especially like to see the trains disappearing into the tunnels. They then race around to the other side to see them reappearing again, all great fun! PS: in case your are wondering, there was no railway station in the village of Wilstone. I name all my model railway stations using the local canal reservoir names! PPS: you can find out about “slate enamelling” on the internet, if you are curious.